Radios Created by pm_mons2522. This templates have specific characteristics, namely: Features- Favorites Station- Push Notifications- Admob support (interstitial)- Background remote control- in app purchase (remove Ads)- Support Xcode 8.x , 9- Swift 3,4- Supports mp3, pls, m3u, aac and . 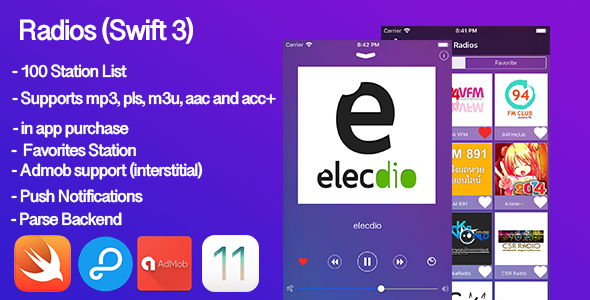 You can use this Radios on Mobile category for app ios, ios, iOS 10.0.x, iOS 8.3.x, iOS 8.4.x, iOS 9.0.X, ios11, iphone, radio, radio online and another uses.